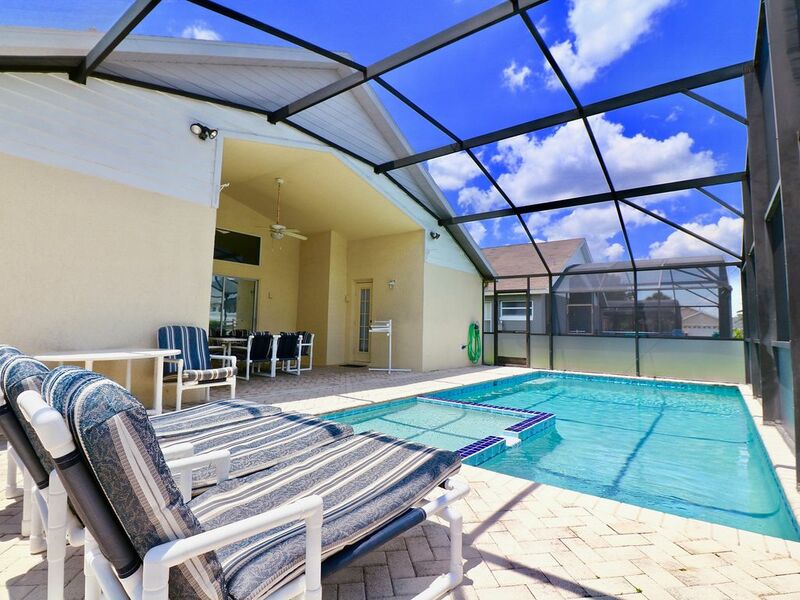 Spacious private home on Indian Creek, close to Disney. Pool not overlooked. Imagine the perfect Disney vacation rental. What does it look like? At a minimum, it’s a home where you can relax. A place where the kids can play (and play and play) safely. A villa that’s completely outfitted with all the comforts of home, plus packed full of additional luxuries. And preferably, somewhere that offers plenty of privacy, and free Wi-Fi that covers the whole house and the pool deck! It’s a home that has all the space your group needs. It’s very, very close to Disney. (You left the commute back home.) It has a game room! And a heated pool! And while we’re on the topic of wish-lists, let’s just throw this out there: Your perfect home also has a separate kid’s pool for the littlest travelers in your group. But we’re here to tell you, it does. Its name is Villa Luja, and it ticks all your boxes: At 5 bedrooms, it’s large enough for your group. Located in Indian Creek, it’s just 3 miles (5 minutes!) to Disney. And it has your game room, your heated pool and yes, even the perfect children’s pool. So you can relax. Enjoy your vacation. Let the kids enjoy theirs. And when you’re ready, you can hop in the car and drive those measly 5 minutes to Disney. Because yes, you’ve finally found your perfect Disney villa. Welcome! Luckily, you’re in Florida, where the unwritten rules states, if it’s sunny, go outside! Luckily, you’re in Florida, where the weather forecast promises sun, year-round. Villa Luja, which was recently retiled in 2015, offers all the indoor and outdoor space your group could need. Starting outdoors, step out onto the screened lanai (no bugs!) and pool deck. The BBQ (optional) and patio seating play host to delicious meals and lots of laughter. The heated pool is inviting, no matter the time of year. And the dedicated children’s pool? Well, it’s begging your kids to have a great time. When it’s dark, or your fingers have finally turned to prunes, or you’re just ready to head inside, Villa Luja is fully equipped for indoor fun: The spacious living room is outfitted with squishy sofas, a huge flat-screen TV, and a DVD player. The microwave is primed for popcorn-popping. Curtain’s up for family movie night! That’s not all, though: If your group is more about competition than relaxation, head into Villa Luja’s sweet game room: electronic darts, air hockey, pool, and foosball (table football) await! And when everyone’s tired after an exciting day at Disney or a leisurely day at the villa, you’ll all be happy to have your own little slice of privacy and space to spread out. Look around Central Florida, and you’ll notice something: Almost every house has a pool, but very few are truly private. At most vacation rentals, your private pool is not-so-private: the neighbors are so close, you could high-five. It feels strange to know someone could be watching you sunbathe, or practice your cannonball, or bbq your lunch, or reapply your sunblock. At Villa Luja, you’ll have none of those concerns: Your sparkling, heated pool is private. (Pool heat recommended October through April.) Screened in and fenced by lush greenery, your pool is yours and yours alone. To swim, sunbathe, splash, grill and, yes, reapply your sunblock without worrying about a wardrobe malfunction. So go on, spread out on that sun lounger. Enjoy your coffee by the pool. Swim laps. Perfect your cannonball. Let the kids play a rousing game of Marco Polo. The pool is yours, and yours alone. Enjoy! When you travel with kids, there’s no such thing as a relaxing afternoon “by” the pool – you’re either in the pool, or you’re not near the pool at all. Kids love water. They can swim for hours and splash for days. They never get tired of playing mermaids or shark, of throwing balls or diving down for sunken toys. Parents, on the other hand? Well, we get tired. Our fingers turn to raisins. And sometimes, we just want to take a sunbath. Happy to deliver! At Villa Luja, you can let the kids play to their heart’s content in a shallow, toddler-friendly children’s pool. It’s the perfect balance: You hang out by water’s edge, lounging beneath the sun, while they splash safely in 18” of water. As always, we care as much about safety as we do about fun. We keep your little ones safe with a pool fence to protect our youngest guests from taking a swim on their own. There are also pool alarms on the doors that lead to the pool and hot tub. Need to stay connected? No problem. Our high-speed free WiFi internet covers the entire home, and even extends out over the pool deck. So go on, upload that poolside selfie. At Villa Luja, you’re in luck – you’re all getting master suites! The villa has three masters and promises privacy for all: The first master offers a king-sized bed, attached master bath, and pool access; the second master has a queen-sized bed, an attached bath, and the third master offers a queen-sized bed and attached bath. The remaining two bedrooms are perfect for kids, too: Lightly themed, one offers two twin beds, the other has two twin beds and a bunk, and share a Jack-and-Jill bathroom. All of Villa Luja’s bedrooms have top-quality mattresses, comfortable bedding, and flat-screen televisions. At Villa Luja, family game night is every night. That’s right – when you’re here, you can hit the arcade, whenever you want (and for free! ), in the privacy of your own home-away-from-home. Write up the roster, chalk up your cue, and practice your aim, because our garage-converted game room is outfitted with electronic darts, a pool tables, foosball (table football), and air hockey. Let the competition begin! There’s something very home-away-from-homey about waking up in the morning, heading for the kitchen, and waiting for the coffee to brew while you’re standing around in your pajamas. You didn’t have to shower, or put your clothes on, or debate with your family about which breakfast restaurant to hit this morning. Nope. You just woke up and brewed your coffee. And you probably enjoyed your first cup by the pool. In quiet, private bliss. The freedom of your own, well equipped kitchen is real vacation freedom: You can order out every meal, or cook up a feast every day. You can pop your own popcorn, or stash the bagged stuff in the pantry. And yes, you can brew your own coffee, or refrigerate your favorite store-bought iced brew. You do you. With you in mind, we’ve covered the musts – and then some! At Villa Luja, you’ll have all the necessities, from the fridge down to the oven, as well as all the other kitchen accouterments: a toaster and microwave, pots and pans, utensils and gadgets, and plenty of place settings. Of course, we all have enough seating for your entire group: a formal dining table (seats 6), a breakfast nook (seats 4), a breakfast bar (seats 4), and the al fresco, poolside table (seats 4). Have you ever lived a Vacation Rental Nightmare? It’s 9 p.m. and the toilet’s overflowing. Or you’re fresh out of clean clothes and the washing machine breaks down mid-cycle. Or perhaps you’re locked out, or you can’t find the wine opener, or you just need a late-night restaurant recommendation. You call, and you call, and you call. But the property manager doesn’t pick up. Or, she does but she’s based across the country and has no local, emergency contacts to help you tonight. You’ll have to wait until tomorrow; they’ll be there sometime between 8 a.m. and 4 p.m. Suddenly, your vacation has morphed into something very different than the relaxing escape you had hoped it would be. We know that the details – the big AND little details – can make or break your vacation. That’s why we’re committed to you, to your experience. We’re local – in just a few minutes, we can be at your front door – and we’re available 24/7, every day of the year, via phone, text or email. What’s more, we have the local professional contacts to handle any emergency, no matter the hour. We’ll get that toilet fixed, tonight. We get it – you don’t know us from the next guy. And simply trusting that we’re trustworthy? You weren’t born yesterday. But trustworthy, we are – and we’ll do our best to prove it, well before you commit to booking. It starts with our response times (often within minutes, never more than a few hours). We go out of our way to answer all of your questions. And we’re honest about it; we won’t fib or exaggerate. We won’t tell you a home is 10 minutes from Disney, when it’s really 30 minutes in normal traffic. ♠♠♠ FULLY LICENSED AND INSURED ♠♠♠ We are fully licensed at both the county and state levels. First and foremost, that means we follow the rules and prioritize your safety: We’ve installed fire extinguishers, smoke alarms, and emergency lighting in all the right places. We maintain tight safety measures at our pools. And all our homes are subject to periodic inspection, by the county and state, so you know that we’re still up-to-date on those safety requirements. Our vacation rentals are legal and above-board. We pay our taxes. You can check our existence in the public records. (Feel free to ask how) ---------------------------------- ♠♠♠ LIGHTNING-FAST, PERSONALIZED SERVICE ♠♠♠ Customer service is the cornerstone of our business, and we know it all begins the moment you first email us. We’re always at the ready, so we respond generally within the hour and sometimes within minutes. That’s 24 hours a day, every day of the year. We’ll never leave you hanging. Of course, it’s not just about how quickly we respond, but about the quality of our responses. This is the part where we tell you how much we love the Disney area, and how excited we are to share it with you. And did we mention? We’ve been on both sides of the fence – more than 15 years ago, we first came here as renters – so we know what matters to you. Want some great restaurant recommendations? We’ve got ‘em. Need discount park tickets? We know how to snag them. Searching for the cheapest car rentals? Not a problem. Seeking the best microbrews in Florida? We’ll point the way. Looking for Segway rentals? We know where. When you rent with us, you’re treated to very personal (and very free!) vacation planning and concierge service. Everything you need, plus all that you could want. So go on, mine our knowledge for all it’s worth. That’s what we’re here for. ♠♠♠ A STRESS-FREE WELCOME ♠♠♠ We may pride ourselves on personalized service, but part of our quality promise is actually just the opposite: We’ve taken the personal out of check-in. Forget having to meet us at the office, on our terms, during our business hours. We’re happy to say, we’ve gone digital – at least, as far as check-in is concerned. All of our rentals have keyless entry, so there are no lockboxes, no keys to collect, and no stressful meet-ups. (We all know how fun those are, especially when you throw in elements like a delayed flight.) When you book with us, we’ll send you a digital welcome guide, packed with helpful information about your rental and the surrounding area. And of course, we’ll let you know how to check-in. ---------------------------------- ♠♠♠ RECENT UPGRADES ♠♠♠ We take great pride and joy in our vacation homes. That’s why personally inspect our rentals at least twice a year, to be sure that everything adheres to our high standards. What’s more, every year, we improve and upgrade our villas. To us, “good enough” is never good enough; we want our vacation rentals to exceed your expectations. ♠♠♠ WALK TO THE PLAYGROUND ♠♠♠ Have a little Disney downtime? Take the kids to the playground – or take yourself to one of Indian Creek’s adult “playgrounds.” Our subdivision offers not only a full-on kid paradise – slide, swings, monkey bars, and even a soccer field – but tacks on grownup fun including basketball, tennis and a putting green. Right here, in our subdivision, just a few minutes’ walk from Villa Luja’s front door. ---------------------------------- ♠♠♠ LOTS OF AMENITIES FOR KIDS ♠♠♠ Parents know: Packing for a vacation with kids, especially little kids, is the worst. The absolute worst. There’s no way you can fit all the required baby gear in your suitcases, but of course, you need your littlest family members to be safe and happy while traveling. We care about your children (and your sanity), so we’ve stocked all our villas with high chairs, strollers, pack-and-plays, and other baby gear. Whatever you need, let us know. We have lots of baby and toddler accoutrements on hand, so we’ll be happy to accommodate. toilet, shower, This bathroom serves the two remaining bedrooms. Villa Luja has three master suites each with its own en suite bathroom. The remaining bedrooms share the fourth bathroom. The air conditioning is pre-set before you arrive to ensure your comfort, but you can adjust it to suit your own personal comfort level. Converted into a game room. Free wifi covers the entire home and the pool deck. Loads of space in the main living area which looks out over the deck and the south facing pool. Filter coffee maker and kettle provided for your use. We can arrange for groceries to be delivered to the home ready for your arrival - please ask for more information. Plenty of dishes and utensils for those who prefer to eat in. Fully equipped with everything you will need. The dining table will comfortably seat six. The dining table in the nook, the breakfast bar and the outside table and chairs provide a multitude of options for your convenience. Flat screen TV in the main living area and TVs in each bedroom, all flat screen. Equipped with a pool table, foosball table, electronic darts, and air hockey. There is also a set of golf clubs available which guests are welcome to use if they wish. Game room is equipped with a pool table, foosball table, electronic darts, and air hockey. There is also a set of golf clubs available which guests are welcome to use if they wish. Pool table in the game room for your family to enjoy. Villa Luja has grassed areas to the front and at each side. Bicycle hire can be arranged for you. Please ask for more information. Large lanai with a dining table and chairs. Several golf courses are nearby. A set of clubs is available for guests to use. Large enclosed pool with separate children's pool. Pool heating is recommended between October and April. Air conditioning throughout the house. Laundry room with large washer, dryer, iron and ironing board. High quality linens and towels are provided. Linen for the crib is supplied but please bring your own beach towels. The garage has been converted to a game room. Driveway has space for 2 cars. The pool deck provides ample lounging and recreational space to all sides. The pool can be heated if required. The games room has a football table, pool table, air hockey and electronic darts. Great place to stay!!! Just as described!!! Owner very helpful!!! Delighted to hear you had a great time at Villa Luja! We hope you will return. Our family spent a week at this villa, and we had nothing but positive things about this house. The house is clean, spacious, and warmth. My kids really enjoyed the pool. We glad that we picked this villa for our vacation, and we will definitely pick it again if we ever visit that area. Stephen was also very responsive during our stay. Overall, we really liked it. Thanks so much Stephen! Lovely home to stay at....very close to animal kingdom and the rest of Disney....plenty of space for everyone at house....small problem with pool (due to weather)...but owner dealt with it very prompt...to our satisfaction....would highly recommend this property to anyone...and would stay here again myself. Delighted to hear Jan that you had such a great stay at Villa Luja! Fantastic villa beautiful surrounding area would 100% come back! Its great to hear you enjoyed your stay at Villa Luja ! Do have a look at our new place which is close by - see listing HA 4843951 ! Family had a great time - would do it again, soon. Lots of beds, nice common area, pool was warm and inviting even in January. Lots of prompts and reminders from Mansgement - was welcome as this was first stay with VRBO. Great location, spacious and spotless! We had a blast at Villa Luja!, perfect location so close to Disney. The new Walmart, about 2 minutes away, made it so easy to stay stocked up. Plenty of restaurants within a few minutes drive. We will be back! There’s a mile and then there’s a Disney mile. And no, we’re not even talking about how many miles you’re going to walk while at Disney. We’re talking about drive time. The miles between you and the parks you’ve come to see. The miles between your kids and the parks they cannot wait to see. The miles you’ll spend trying to ignore a chorus of crescendoing are-we-there-yet?s, and breaking up spats between excited (or overtired, depending on whether it’s a to or from trip) kids. The miles that won’t feel like vacation – those are Disney miles. Luckily, at Villa Luja, there are only three of them. Three miles, we mean. Just three short miles between you and Disney. That’s five minutes. You can survive five minutes. Indian Creek and Osceola County are a golfer’s wonderland, and Villa Luja sits smack in the center of some of the best golfing in the area. If Mystic Dunes doesn’t scratch the itch, then hop in the car for the 10-minute drive to the Champions Gate International and National 18-hole courses, both of which were designed by Greg Norman. The International provides a British links-style experience, while the national is traditional American style. The David Leadbetter Golf Academy is just adjacent to these courses. Pool heating is optional at $30 per day / $180 per week plus tax. BBQ Grill rental - from $60 per week plus tax. Early check in / late check out may be available and is charged at $75 plus tax. Please note that in the event of cancellation a processing fee of $125 plus tax will apply.